Whilst usually asymptomatic at relatively low levels, it is important to identify and treat the condition early due to cardiac and other complications that may arise. A patient may commonly be asymptomatic; symptoms are rare in patients with a potassium serum concentration of less than 7.0mmol/l. Any symptoms of hyperkalaemia that may present include paraesthesia, muscle weakness, nausea and vomiting, and palpitations. The patients observations and fluid status should be reviewed, as well as their medication (identifying any precipitants of hyperkalaemia). The ECG is vital in the assessment of hyperkalaemia, as ECG findings will progress with increasing serum levels. Whilst the ECG findings generally can be correlated to the serum potassium concentration (Fig. 1), potentially life-threatening arrhythmias can occur without warning in hyperkalaemia. 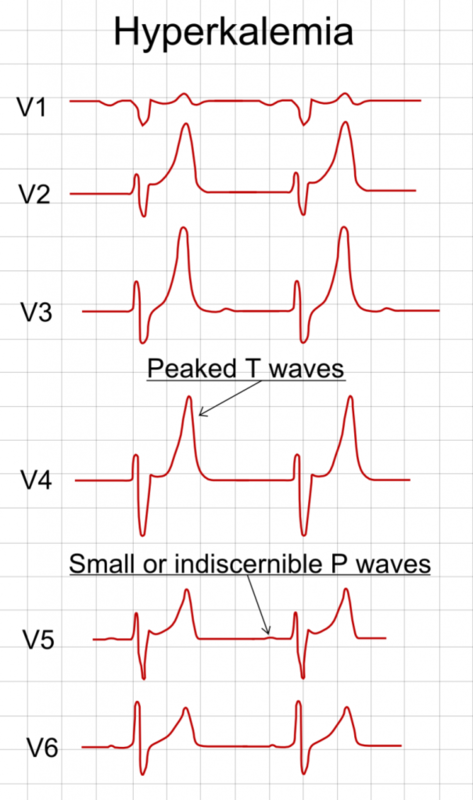 The progressively widened QRS eventually merges with the T wave, forming a sine wave pattern. Subsequent Ventricular Fibrillation (VF) or asystole may then follow. Whilst the rationale for the first and second management strategies may be self-evident, it is important to consider that the underlying cause for the hyperkalaemia must also be addressed. Early and repeated blood testing is vital and any ECG changes warrant urgent treatment and moving the patient to a high-dependency area. Alert a senior to any complications developing. Continuous cardiac monitoring is required following stabilisation treatment. Variable rate insulin with dextrose infusion should be started (typically 200ml of 20% glucose with 10U of insulin over 30mins, yet dependent on local guidelines), acting to increase cellular uptake of potassium and thus reduce serum concentration. These measures are only short term, as the potassium will leave the cells within 30-60 minutes, therefore repeated doses may be required. Salbutamol nebulisers may also be additionally added in for further (albeit limited) reduction. Any reversible underlying cause should be identified and appropriately managed*. Referral to renal physicians may be warranted in cases of severe hyperkalaemia or resistant hyperkalaemia potentially warranting haemodialysis. *Oral calcium resonium can be used to reduce total body potassium, reabsorbing potassium into the bowel intra-luminally, however this step is complex and specialist input should be sought early. Which of the following is NOT a cause of hyperkalaemia? Which of the following is not a symptom of hyperkalaemia? 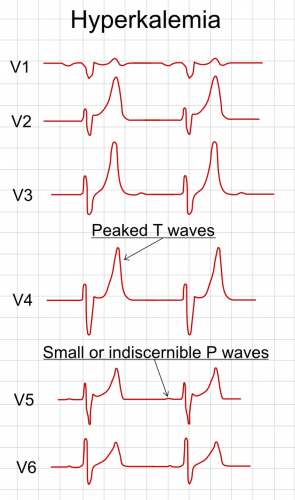 As potassium rises, which ECG change occurs first? How is the myocardium stabilised in the management of hyperkalaemia?